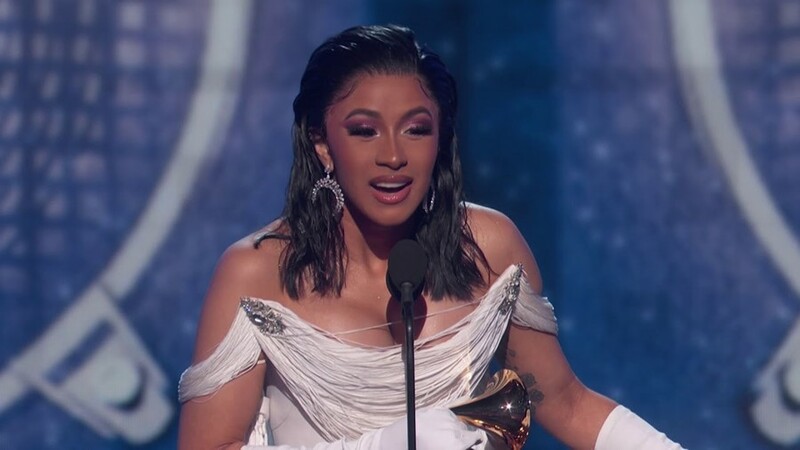 At last night’s Grammys, Cardi B made history – the Bronx rapper became the first female solo artist to win Rap Album of the Year at the awards show, for her record Invasion of Privacy. Cardi shouted out her husband Offset, her collaborators, and daughter Kulture. It was a monumental moment. Lauryn Hill was the last woman to win the award, when she was part of the Fugees, over two decades ago. Other momentous wins include Childish Gambino’s Record of the Year, Rap (Sung) Performance, Best Music Video, and Song of the Year scoops for the politically pushing “This is America”, marking it as the first rap song to win in these categories. Record of the Year honours the recording artist, while song of the year is for the song’s writer. The rapper and actor was not present to receive his award for the song, and it was accepted for him by presenters John Mayer and Alicia Keys. His producer Ludwig Göransson accepted the Record of the Year accolade, and shouted out 21 Savage in his speech (who has been detained by ICE), one of the many background vocalists on the track. One of the night’s biggest winners was Kacey Musgraves, who picked up four Grammys for her stunning album Golden Hour. The album, a glorious mix of country, pop and psychedelia that brought country to the forefront of 2018’s musical output, scooped Album of the Year, Best Country Album, Best Country Solo Performance, and Best Country Song. Musgraves’ “Slow Burn” was in Dazed’s top tracks of the last year. "It was really important for me to bring my version of country music to a different group of people," she said during her Album of the Year speech. Lady Gaga took home two awards for Best Pop Solo Performance, for “Joanne”, and Best Song written for Visual Media for “Shallow” in A Star is Born. Ariana Grande, who didn’t attend but dressed for the occasion at home, also picked up Best Pop Album for Sweetener. This year, the major categories – Album of the Year, Record of the Year, Song of the Year, and Best new Artist – increased the nominee count from five to eight, reportedly to allow for more diversity among those up for awards. And though she wasn’t up for any awards, icon Diana Ross marked her 75th birthday with her live performance, leading her own “Happy Birthday”. Here’s a round-up of the most noteworthy winners below.